What is an IB Roof? In 1978, IB Roof Systems took the original design improved it with the latest technological know-how’s and created the ultimate roofing solution for both residential and commercial/industrial flat roofing market. In fact, IB’s formulation works so well, that it has not changed since 1979. IB Roofing membrane features a unique design, incorporating 100% virgin PVC in its formulation as well as ’50/50 equal thicknesses’ Top/Base film laminated to polyester reinforcement scrim (note, that competition’s top film thickness does not exceed 35-40%). Top film and it’s advanced formulation, is what makes IB’s membrane long-lasting, by resisting the destructive powers of U.V. rays, as well chemicals and substances that are normally present on flat roofs, and cause the degradation of the roofing material, resulting in costly leaks. We have an exceptional track record installing IB Flat roofs in Massachusetts, Rhode Island and Roofs in Connecticut with leak-free installations on commercial and residential IB flat roofs. All seams and flashing details of IB flat roofing system are Hot-Air welded. This process incorporates precision welding equipment designed and produced in Switzerland – the home of world’s best watches such as Rolex, Rado and others – such equipment is widely used in civil as well as US military applications. Hot-Air welding creates a physical bond between two separate sheets of IB roofing membrane, effectively making them on piece. Unlike chemical bonding where glues and/or other types of adhesive are used, hot-air welding eliminates the possibility that seams will come apart due to adhesive de-lamination or chemical break-down. IB Roof is a versatile flat roofing system that can be adapted for any flat roof type and level complexity. Condos, Cooperatives and other Multi-Unit residential buildings. IB DeckShield* – a slip and water-proof, ADA (American Disability Act) compliant decking material can be installed. Due to anticipated constant foot traffic, IB DeckShield carries a 10 year warranty. Ponding water is the leading cause of leaks on flat roofs. In MA, RI and CT, as well as other parts of the US, with the old construction methods of 20th century, there are now thousands residential and commercial flat roofs exposed to leaks. Ponding water creates puddles on your roof that have no way to be drained due to shortcomings of the original design and impossibility to create new drainage methods. This standing water destroys your roof by breaking the seams, saturating the insulation, and rotting the wood decking. Once water enters inside the building, it damages the structural components, ceilings and drywall, flooring, as well as electrical system. The combined costs of internal repairs due to roof leaks, may greatly exceed the cost of installing a new IB roof. While the majority of roofing systems are not warranted against ponding water that occurs for more than 72 hours, since their seams cannot be permanently sealed with adhesives, IB includes explicit Ponding Water warranty with all of its roofing membranes! IB can do so because their seams – while being the WEAKEST point of other, conventional roofing systems – are actually the STRONGEST parts of IB flat roofs, and are designed to withstand constant ponding water. IB Roofs have been in service since 1978 with zero material failure. The key to such an amazing performance is the way the overlapping seams are attached. Unlike conventional roofing systems, where adhesive is the key component as well as the major flat-roof failure factor, IB’s seams are Hot-Air welded by precision Swiss-made welding equipment. Once the seam is welded and cured (which takes about 1-2 minutes), it cannot be broken without tearing the membrane. In fact IB seams are stronger than the membrane itself. Hot-air welding ensures that seams will never come apart, thus the integrity of the roofing system is consistent through-out its life-cycle. IB Roof Systems is so confident in their product that it is covered by a 100% non-prorated Residential Lifetime Warranty and up-to 25-years Commercial Warranty. IB roofs installed over 25 years ago are still performing leak-free, and save their owners money in repair and maintenance, as well as energy costs. The ever-rising energy costs may put a big dent in your budget. Air-conditioning in the summer may be just as expensive as heating in the winter. This is where IB roof really excels with its Cool Roof qualities. IB’s white membrane reflects up to 90% of solar heat. What does it mean to you in terms of savings? On a 85-degree day, a regular black-color flat roof such as EPDM, will heat up-to 170-degrees and will transfer that heat into your house or building. IB will only go to mere 91 degrees, saving you tons of money in direct costs as well as making a small, yet important difference for the environment, as over 45% of US’ electricity is produced by Coal-burning power plants polluting our air and causing global warming. IB will save you an average of 20% or more on the Air-Conditioning costs, which can run into hundreds of dollars per month. With the ever-rising electricity prices, this is especially crucial for climate-controlled storage-complexes, restaurants, and refrigeration-facilities, but will greatly benefit any home or building that uses Air-Conditioning equipment. In the winter, IB roofing membrane in conjunction with the insulation will keep your place warmer, as it is a Heat barrier, so you’ll be saving money year round. Flat roof leaks mostly occur either at the seams or around roof penetrations such as vent pipes / drains / HVAC curbs / sky-lights, etc. Most flat roofing systems fail to address these issues appropriately, and instead rely on some sort of adhesive and flashings produced by a third party, often with questionable quality. IB Roof is the only flat roofing systems that comes complete with all flashing detail parts manufactured in house, and giving you the quality and peace of mind. IB provides a wide range of flashings made from the same CPA/PVC material as the as their membrane, which were designed to accommodate every possible flashing detail on the roof. Inside and Outside Corners made for HVAC curbs/sky-lights/chimneys, etc. Through-roof drains designed for commercial, residential and restaurant application. These drains can be as simple as a drain-liner, or as sophisticated as aluminum body drains with over-flaw protection and a leaf/dirt guard. 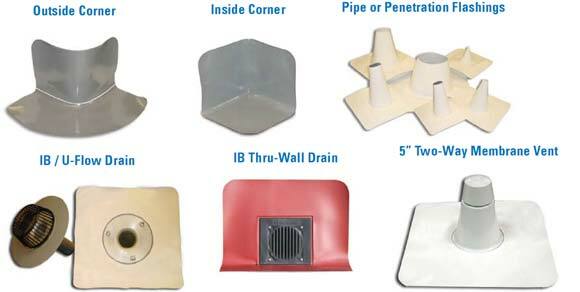 A variety of vent-pipe boot flashings that come in sizes from 1″ to well over 1 foot in diameter, to accommodate for any size of ventilation or hot-stack pipes, electric posts and other roof penetrations. Integrated PVC Air-Vents made of industrial-grade PVC were designed by IB to provide adequate roof ventilation for mechanically attached installations. Many more standard and specialty flashings such as Through-Wall drains, Custom Scuppers, and even PVC-coated drip edge all make IB a completely integrated flat roofing system. These flashings are all welded together right to the IB roofing membrane with hot air, effectively creating a single-piece roof blanket, which is not dependent on unreliable adhesives. If your IB roof gets some sort of damage like a falling tree or if a sharp object was dropped on it 5, 10 or even 20 years after it was installed, repairing it will be a breeze. All that will have to be done is a small patch welded over the damaged area – it’s that simple! IB roofing material will not cure with age, it will not become brittle. An IB roof can be repaired even in the sub-zero temperatures of the winter, when other roofs may not be repaired due to adhesive freezing before it is applied. IB roofs are time-tested to remain weldable for over 20 years not only in the lab environment, but in real life. Harrisburg School district got all their schools a new IB roof over 25 years ago. While these remain leak-free, IB tech representatives went out and tested those roofs for weld-ability. The result – they are still just as elastic as they were in 1979, and no problems re-welding them. So if you have mechanical damage or want to add a sky-light or an HVAC unit to your roof after it was installed, you will not have any troubles. IB flat roofing membranes were originally designed and tailored for the needs of commercial flat roofing market, addressing strict reliability standards. Soon, it became obvious that residential flat roofing market had to be addressed a well. In addition to its classic white single-ply roofing membrane, IB addresses all you needs with their custom and specialty roofing membranes while keeping their best qualities. Some special situations include an architect specifying a certain color, or a building design calling for heavy roof traffic. IB carries over 6 standard colors, as well as the ability to create over 450 different custom colors for commercial and residential applications. For residential flat roof with slight pitch, IB Traditions offers the incredible line of Architectural Shingles printed on IB membranes, giving you the of two worlds. Great looks and reliably of IB’s original design. IB Traditions is perfect low-sloped residential roofs with 3-in-12 pitch or less. It will give your house an astonishing look with unsurpassed protection of IB’s lifetime warranty. Stop replacing your asphalt shingles roof every 10 years and dealing with annoying and expansive roof repairs. IB Traditions will outlast any roof and will keep you happy! If you have a deck on your roof, chances are the roofing membrane underneath that deck is leaking. IB has created a special Deck Shield Membrane, that combines the water-tightness with great look and slip-proof top on which you can walk even when it is wet. In fact, IB Deck Shield exceeds the American Act for Disability’s slip-resistance requirements. 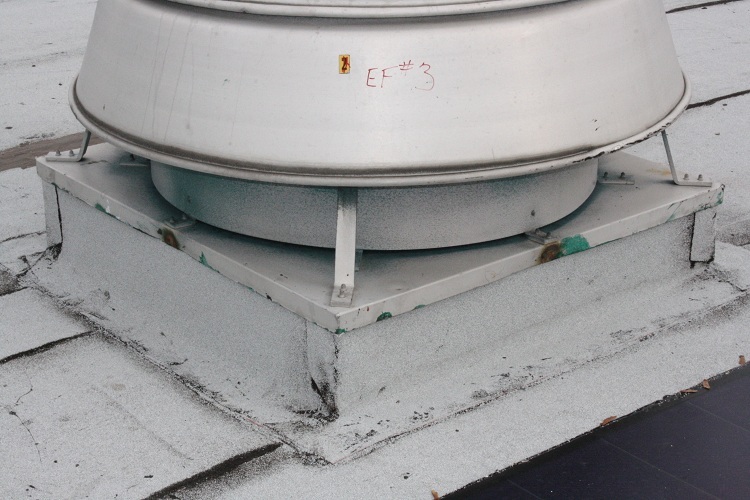 Commercial flat roof for restaurant, deli/bakery, industrial manufacturing or even a chemical production plans where oil and grease build-up from the roof-top exhaust vents, poses a great deal of risk. Oil and grease dissolve the roofing membrane much faster than regular flat roof contaminants. Combined with acid rains, these harsh conditions greatly reduce the life expectancy of such roofs and increase your expenses, as well slow down your business. With IB ChemGuard you can relax and concentrate on you business, knowing that you roof is covered with the Best Restaurant roofing membrane. ChemGuard is designed to surpass ASTM standards and protect against such roofing hazards as animal fats, cooking grease, motor oil, gasoline, acid rain, and numerous other harsh chemicals and acids. Eliminate lost revenue due to unexpected roof leaks and repairs with IB ChemGuard! Final Words: IB Will Be the Last Roof You’ll Ever Need! IB has designed an entire roof system that will go on quickly, efficiently, and with precise accessories for vents, skylights, and more. In fact, IB can waterproof whatever roofing or decking surface you have, from surfaces around hot tubs to roof top gardens. All in all, IB is simply the BEST roof around, and the one you can forget about! Now you can calculate the cost of installing a new IB roofing system and the cost of alternative options, as well as your annual energy savings with an IB White roof. The instant price quote is very accurate and will provide you with price comparison for 4 different flat roofing systems – IB Roof, EPDM black rubber, Tar & Gravel and a Built-Up Roof. You will also be able to estimate annual energy cost reduction with IB’s Cool Roofing white surface. In Arizona it gets to be 120 degrees, with that rubber on top of house I think it would heat up my house costing more in air conditioning bills! Any comments on heat from a rubber roof?? Rubber is horrible in places like Arizona, and you are correct – it would be like sauna with a black roof on top of the house. However, I don’t think they sell rubber (EPDM) in Arizona … maybe just in northern parts. For example, in Florida it is impossible to buy EPDM rubber roofing through distribution / roofing suppliers. They just don’t sell it at all. When I was there, I needed some material, and couldn’t get it anywhere. I think it’s the same or very similar in Arizona. I. Had a IB system installed in 2003. I have a combined flat top to of on my home as well as shingles. Over the years I have noticed a slight raising of the material along the edges of the roof. It has progressively gotten worse. There is now a section of material along the roof edge that is 4 to 5 inches above the base of the roof. This extends out 3 to 4 feet from the edge of the roof. It looks like it is shrinking causing the material to lift up. I had a POS “factory rep”, come and look at it and he said the problem is called, “bridging”. He could not provide a cause or solution. His concern was wether or not it leaked , it doesn’t. Does the material shrink? What is bridging? 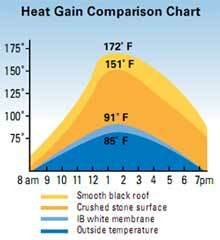 Can you use IB roofing in an area that get pretty hot in the summer time? 100+ degrees? Thanks! Matt, yes you can – IB is excellent in hot climates, and it reflects nearly 98% of solar heat. Hi. We have a Mahogany roof on our back deck. Though beautiful, whatever is over it causes leaks into my husband’s wood working shop. I would like to have a quote and possible install on a flat roof in Ridgefield, CT. Can you help us? Please fill out our free estimate form here and we will contact you soon. Just yesterday 3/1/16 I asked for a home owners insurance quote from top ins. co for seniors organization. They said they, just recently, have made the decision to not insure homes with vinyl roofs. Do you know anything about this issue? I would like a cost and benefits comparison between IB and other flat roof system. Also, please send me information on certified installer in the area I live which is Kirkland Washington 98033. I’m located in LaPorte, Indiana. NW indiana not too far from manufacturer. The local roofer that installed it probably won’t do a patch repair. I don’t think they put down foam under membrane, that’s the main issue. Most PVC roofs have foam insulation UNDER membrane. That is not the issue. Your roof is leaking because there are holes or seam voids (seams opened up). As I said, it is easy to fix – get ANY roofer that installs thermoplastic (PVC or TPO) and they can use scrap materials from ANY pvc roofing to patch your roof. I currently have an IB roof that is about 25-30 yrs. old. It currently has several bad areas that are leaking. I would like to repair it. Is it possible to get materials for a diy person? Also is there a coating I can use on this roof? I am not fond of local installer. Depending on where you are, you may be able to rent it, and get some scrap pieces from local roofers. However I don’t recommend DIY unless you have tools / materials and know what you are doing. DO NOT use coatings. Once you waste your money on it, you won’t be able to repair your roof AT ALL … PVC is an easy to repair system… just get a good local roof mechanic (commercial roofer, union or not) for a saturday or sunday and pay him cash. Need contractor in Chicago who installs ib pvc roofing. Looking to find if their is a 30 year guaranteed (no maintenance) flat roof. This would be commercial installation 63 buildings, 440,000 sq ft.Would like rough estimate of cost per sq ft installed. We are a large HOA Condominium, 63 buildings, two story, flat roofs, 439,000 square ft (6 phases) in Rancho Palos Verdes CA. Currently we have hydro Seal membrane roofs with 30 year guaranteed life . Roofs require mandatory re-coating at 10 year intervals and then full replacement after 30 years. Will be starting a second re-coat cycle within next 2 years. Right now we are in a search mode and would like to know if a such product exists and probable cost per foot. I assume “walk threads” are the same as “walk pads?” Because there are various different paths of the foot traffic, I would eventually have to covet the entire roof with the pads (the roof is only 400 sq. ft.). Also, I have heard that even in commercial applications, workers often go off the pads for one reason or another. I wear sneakers and am careful, but I am concerned about others. Do you think the 80 mil will be OK? Is the 80 mil more difficult to work install around turns, edges and things? Regarding the slippery when wet or cold: Is this black ice type uncontrollable slippery, or maneuverable if you are forewarned and careful? 1. I have heard that it gets slippery when wet or cold. how dangerous is this? (I or some trade will be on this small flat roof (400 sq ft) about a dozen times per year for one maintenance reason or another. 2. My roof slope is only 1.25 inches over 12 feet (that is, less than 1/8 per foot). It will drain, but over time some deflection or dents may occur, which could cause ponding. I would appreciate your opinion. Am I over-thinking this? There is little room for tapered because of a 3-inch high door step. 1) if you plan to have foot traffic, get 80 mil PVC with walk threads along/around the areas with expected foot traffic. This is common practice on commercial roofs with constant maintenance. 2) While 1/8″ per foot is the minimum required slope for sne construction low slope roofing, it is still good slope to get the water off the roof. Small puddles will dry out fast. If you are worried about indentations, have 3/8″ DensDeck installed over insulating. Your roof will then be bullet proof. Additionally, PVC is made of ZERO slope and ponding water, so with positive slope, you will be in great shape. Don’t worry, and good luck. If you are in New England, we can take care of your roof. Give us a buzz. I want to cover(waterproof) my 14×26 deck. I have about 8′ under the deck and use the space for storage. I’m not concerned about temperature. Obviously, we walk on it. The traffic is not high, but we’re on it occasionally. I’d like to go over the current 2×6 decking. I’d like a light tan color. I would like to be an Independent Distributor for the product to use it for for repairs. I am new to roofing. Please advise me on the next step I should take. Please call me at (317) 972-xxxx. Unfortunately it’s not going to happen because IB roof is sold directly to approved contractors – this material is not sold through distribution as means to keep up installation quality. How do you tie-in this material from a flat roof into a sloped asphalt shingle roof? How do you terminate at wall (plywood sheathed w/aluminum siding)? We normally remove 5-6 bottom rows of shingles, run IB roof up the slope, nail it down, and seal the top to roofing underlayment with SolarSeal 900. We install separation sheet on top of IB Roof on the slope, to separate it from asphalt shingles. We typically use GAF Deck Armor synthetic underlayment. Then we install shingles back, leaving about 6-10″ from the pitch change to the bottom row of shingles. We usually get new color matching shingles, as old ones are usually damaged when removed. On the sidewall – we remove bottom of the siding, flash IB roof to the wall with Solar Seal 900 and IB water stop, nail or screw it to the wall, and install siding back, overlapping the IB roof. You will need at least 6″ up the wall flashing, fi conditions allow it. I have a question about the chemical make up of IB roofs. Is dioxin released when the seams are welded together? your materials.I need to replace my flat roof. I mentioned condensation earlier, as a problem we got under our new white IB roof (chosen intentionally from the very short list of “cool white” or “high emissivity” roofing products at energystar.gov). Here’s how it works — day _and_ night, the roof is getting rid of heat by emitting it to the sky, so the roof can cool below the ambient outdoor temperature. If it cools below the “dew point” water condenses on the roofing, top and bottom, so you can get water condensing inside the attic as we did and dripping off the holddown screws. What you need is a sealed attic (no vents and no air leaks from the living space, so the attic always stays dry) or else a vapor barrier and insulation underneath the IB material, so humid air from either the living space or outdoors getting into the attic can’t get up against the bottom of the cool white roof where water condenses. One example — this is routine for IB and others in areas where it gets really cold — would be a couple layers of isocyanate offset and taped. What we found is that an old house leaks moist air from the living space; put a perfectly waterproof white IB “cool roof” onto the house, and you can get condensation even in mild climates and warm weather. PS to be clear — no glue involved here anywhere except around the plumbing stacks, where there’s cone-shaped IB material held at the top with a stainless hose clamp; those got a white caulk to seal them. The IB is put on using screws through big round washers; those are underneath the next overlapping piece of the IB material. OK, I’ll send a picture. This is a ‘Dutch gutter’ roof — made with a 1×6 standing on edge at the outside end of the rafter tails; the IB membrane wraps up and over the top of that and down a bit on the outside. Quite standard in our area, 1920s built. So the galvanized flashing wraps down both sides of that 1×6, over the outside edge of the IB membrane. Screws with rubber washers go through the top of the flashing, through the IB, and into the top edge of the wood. So I didn’t recognize the need to get it spelled out. 2. I didn’t know 6 count 4×4 posts would be such an issue…you quoted previously $80-100 extra per post… + they need to be cut and installed to joists…more $$$ ? 4. I do NOT plan to use Mod Bit. My recent research (starting with your excellent site) has led me toward high-quality SPM with long term Manufacturing & Service track record. 4. I’m still considering FiberTite, since my first IB Roof bid was off the charts ($10,000 for roof + railing) and only 1 other IB Roof contractor, I can find in DC, will do small residential work. 6. The FiberTite Contractor & Local Sales Rep are both claiming that FT is superior to IB Roof: 1) Better Tear / Puncture Resistance & 2) Better Long-Term Flexibility & Weldability (I’m not agreeing…seems IB Roof has 30+ years of good real-world testing) Any thoughts ??? Tear-off, 2 base layers, Mod Bit top, flash = $3000. In general, from your experience, how does Mod Bit pricing compare to IB Roof pricing (let’s use 50 mil product) ??? I think IB is 25-30% more than mod bit. However you got me thinking – if I was in fact installing mod bit, I would not touch that roof for less than $4000 with details you described. I mean 3-ply small roof with tear-off + repair, and then SIX post flashings… Mod Bit is not made for that type of delicate detail work. and Imaging doing it with a torch … ouch. So in this case I think you mod bit guys are just completely desperate for work, or do not know what’s up. Is mod bit in question a granular or smooth surface? Imagine having this flashing on a 4×4 wooden post, done using torch. Cold applied method is even worst, because it will leak so fast. > Should I install $2000 worth of copper for free? Of course not. IB’s website shows the optional edging that’s not part of the bid. I didn’t know that, til the galvanized was installed and I found out I needed to get it etched and painted and maintain it. I was just surprised to get something not on IB’s website that the roofer didn’t spell out — I thought IB provided all the materials, and that wasn’t what happened. I don’t know why they did not use IB clad metal / IB drip edge (which is 22 ga galvi steel with 22 mil PVC coating on it). It makes no sense to me because it is actually easier to use IB drip edge than to fabricate, clean and glue IB membrane to galvi steel. besides, glue also costs money and I don’t know of a good glue for PVC roofs. Every contractor is different, and does things differently, and IB can’t micromanage every applicator. However, I do thing that it is actually acceptable practice to use galvi steel instead of PVC-clad metal incertian situations. I try to spell out details in my contracts to avoid doing stuff for free, and avoid any issues / misunderstandings with customers later. However, you can’t spell out EVERY little detail. Like should I include in my contract where I’m going to place each screw, or how many rows of materials I will lay down? If I have a client who wants me to do that – I will return deposit check, wish them luck and part ways. Also Hank, I am still confused as to where (drip edge or termination bar or special drip-edge facing or somewhere else) they used glavi and may be it’s actually ok, and you don’t need to maintain / paint it at all. Send me pictures. Sent you a direct message. 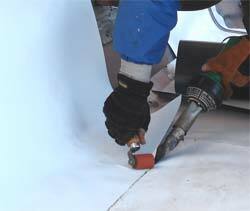 How about to replace bitumen modified membrane on flat roof and then use GacoRoof as white coating? Check Gacoretail.com site. It said it will not damage bitumen modified membrane in ponding water and last lifetime. The price would be cheaper and lots of roof contractors are familiar with this type of roof work. Even I can coat the roof myself with Gacorroof white coating after the roof is replaced. What do you recommend about the Gacoroof white coating? “Replace bitumen modified membrane” with what? What is GacoRoof? Besides the fact that it is a coating – is it acrylic, urethane, rubber or something else? I think you are just trolling & advertising this Gaco stuff here, but I will give you a benefit of the doubt and assume you are a concerned individual and/or homeowner with a flat roof, and do think that Gaco roof is good (i’m not saying it’s bad). Point 1: “It said it will not damage bitumen modified membrane in ponding water and last lifetime” – it will not damage mod. bit. or will not damage it in ponding water areas? If Mod. Bit. roof has ponding water is is 99% leaking and is not designed to withstand water pooling, so there is your 1st problems. Most coatings will not help you with ponding water roof leaks. In fact, most coating are not even a roof. They are just that – coatings, designed to give your roof a “Cool Roof” reflective surfaces. Some are actually waterproofing products if applied in multiple coats, and make about 30 mil minimum thickness. In my opinion only urethane and in some instances acrylic coatings can be used for waterproofing purposes, to EXTEND the life of existing roof. Also – aluminum coating is ONLY made to add cool roof factor – it is not waterproofing product. Point 2: The price would be cheaper and lots of roof contractors are familiar with this type of roof work. – Nonsense! Very few contractors are familiar with coatings, and they usually specialize in this type of work and ave all the equipment setup in work vans and typically travel around the country or a certain region. These are pros. You can’t get Joe Shmo the shingler to coat a roof for you and expect half-way decent results. The price is “cheaper” for thin 2-coat application. Once you start adding thickness, price goes up. Also coatings can be applied only over acceptable surface, and will not work for any type tar and gravel rofo or granular surface roofs. Point 3: Even I can coat the roof myself with Gacorroof white coating after the roof is replaced – you are full of chit sir :). Seriously! I had to do huge research for my first coating job and had a supplier’s rep on the job and on the phone with ton of questions and details. I also had to buy specialized equipment. So I think you are a troll and advertising your gaco stuff. I also think you were hired by outsourcing firm and you live probably in India and know nothing about roofing! It is modified bitumen or mod. bit. – not “bitumen modified membrane”. And half of mod. bit. is granular surface and your gaco will not work. you confirmed my thoughts. going to go with IB and normal roof removal…being as environmentally aware as possible! i live in dallas tx and my main concern is heat resistance over time with IB…we are in day 15 of >100 degrees….no rain in a month….i asked roofing contractor about IB and he said it would not do well in texas heat. your thoughts? they are also considering placing ISO insulation on top of mod bitumen for a little more R value instead of removing old roofing. I do live in the snow country but we too get many days of 100+ degrees weather every now and then and never had any problems with IB roofs. My first IB roof, I installed in 105 degrees for 5 days straight. There are many IB roofs (i don’t know how many thousands) installed in the deep southern US and they never had problems. IB has an office in Dallas – you may contact them to get specifics. Bottom line – saying that IB roof, or PVC in general is not for hot weather is nonsense and is spreading FUD. I would actually say that TPO may be the one affected by high temperatures and sun – TPO Problems report by MRCA (Midwest Roofing Contractors Association). Information is being circulated in the industry indicating that high solar loading and elevated temperature lead to the premature exhaustion of anti aging components such as anti oxidants, UV absorbers and heat and light stabilizing compounds within TPO. This could lead to the breakdown of the sheet in affected areas. Also, “considering placing ISO insulation on top of mod bitumen” – while acceptable practice by building codes IF you have 1 layer of roofing materials, this is not recommended, since your roof has probably leaked and trapped moisture will rot the roof deck. Your contractor is probably a hack and does not want to do the roof right – they want to be in and out as fast as possible. Adding ISO is good. Not removing old roofing is questionable at best. I have personal issues with roof tear-off, but these have to do with me being environmentally conscious. However as a roofer, I think it’s best to tear off and install new roof over dry, clean roof deck. You won’t necessarily get that if you don’t specify it in your contract–as with all the details like vents, you can’t assume the IB installer/local rep will be using entirely IB products. We got unpainted galvanized sheet metal with the IB screwed down onto it, to our surprise. Of course you would need to specify copper drip edge – it cost us $15-20 or more per linear foot, depending on details and total amount. Imagine you have 100 feet of drip edge? Should I install $2000 worth of copper for free? As far as as other specs / details – yes things need to be specified, and I always include all, even smallest details in my contracts, to avoid issues. Some other roofers may not. As far as your roof ( I promise I will get to your comment from before – you posted them when I had a baby and I did not have time for anything). Any way – basically all you need to get rid of condensation is to install 4 to 8 pcs. of 8″ IB deck vent – it will give you good air circulation in your attic. You would of course need the roof and deck opening cut out – about 8″ round or square hole in the roof. As for galvanized metal – if it’s termination bar – it’s no issues – you can use aluminum or still or PVC coated IB term bar. if it’s drip edge – it depends on how they set it up, but yea – IB has their own PVC clad metal, so why use galvi.. Need only 6 count, 4×4 posts, not 8 to 10 as I first thought. Getting 1 more IB Roof contractor quote. Just called back. Good timing. Result: you are #4 result, behind Fibertite Corporate (1 & 2) & spri.com (#3). That’s pretty damn good! You must have a magician working the web matrix for you! #4 is outstading for a small private company. Think about it, you’re ahead of every major manufacturer but FT – how’d ya pull that off? My roofing calculator is a bit outdated – I really need to get to it and update all kinds of numbers, and add tapered insulation to it. It is also not made for calculating roof decks. I will be making a special roof deck calculator very soon. Also you need to realize that small roofs will be major PITA most of the time and will take very long time for each sq. ft. installed. It is much more profitable to do medium to large size roofs because homeowners with small roofs think they should cost very little, since they are small, but your (roofing contractor’s) setup cost are the same for a small job and a big job alike. Also roofers need to make X number of dollars to break even each day and Y to make a profit. A small 300 sq. ft. job can take 2-3 days while same crew can install 20 roofing squares in the same time, and make much more money. That is why we NEED to charge more on smaller jobs. 7 grand does sound a lot, but I do not know the specifics of your roof. Typically you are correct, and your roof would be $3000-4000 range. But I myself just recently quoted $6800 for a 256 sq. ft. roof, and another $750 for custom made parapet caps. So everything is possible – it all depends on details. The roof I quoted was a concrete deck where we had to get rid of ponding water, while dealing with VERY low clearance between the roof and the window, and also had to work our roof to wall flashing along multiple weird bump-outs in a brick wall. It was also an 80-mil roof. So, long story short, unless you provide more details about the roof and specs / details, I can only say that it might be a bit overpriced, but I’m not sure. As far as posts – we charge $80-100 per post flashing, depending on the roof details and posts locations. In your case I would just install a 50-mil roof with no railing / no penetrations and now other costly items, especially that you already have a deck on the other side of the house. Why spend more money on another deck? Let me know what the other bids were. 1) Is your cost Calculator up-to-date? If not, what would be a good % increase # ? I’m just shocked at the $7000 bid. I figured $5000 would be the upper limit. Just received the first IB Roof estimate…glad I was sitting down! $7000, that includes tear-off rolled asphalt & spec IB Deckshield. I requested a comparison price for 50 & 80 mil IB membrane but they did not give me that. There is a railing on three sides which means 8-10 4×4 posts installed & flashed…BUT, I would think at most that adds a few hundred…other than posts, a VERY straightforward job. Now, you’re in the Metro Boston Area, which I figure, for Cost of Living issues, is comparable to the Wash. DC Metro Area. Can you offer any suggestions why my bid was > 2X your Cost Calculator? what’s up with the memebrane vents? on the details with copper. how do u attach the pvc to copper??? Thank you vey much for taking the time to offer such a detailed response. Yeah, I might be overthinking this a bit. I just want the roof to last. Once it’s on I don’t want to think about it all. Hopefully for 20+ years. I let the IB Roof sales rep know I found out about their product from information on your web site. I know Todd Lesnett – the IB rep down in your neck of the woods. I met him few years ago at a Roofing Expo in Atlantic City. He’s a great guy – say hello if you talk to him again. 1) On an 8 x 30 flat roof (over open front porch, no penetrations, no angles, rip-off old asphalt) – how much additional cost would it add to the job to install a quality tapered iso board to properly channel the drainage? Can you offer this as a ballpark figure for roof with & without tapered iso board &/or as a percentage of the total cost. 2) FiberTite site & reps claim that ANY PVC roofing product has issues with mobility of plasitcisers through time. They outright claim that due to this situation, FT is better then ANY PVC product longterm for flexibility and weldability. Feedback? As far as article you linked – it was written by a general home improvement guy who writes for Seattle Times – he’s not a roofer and over-generalized the PVC roof. Like I said it’s nonsense – you can easily walk on ANY PVC roof – even old Trocal roofs in 50 degree weather. It’s when you get below 32 degrees (freezing temperature), Trocal may not hold up. Other PVCs will. 1) Without tear-off (that’s too “local” for me to price and I don’t know what’s under tar and gravel and how much dump fees will be), just to install 50 mil IB roof and flash it to the wall (i assume cedar siding here) – in Massachusetts, you would be looking at $2200-2500. Tapered would be another $200 approximately. Once again this is OUR pricing here in MA. I don’t know what people charge down in DC. 2) FiberTite is essentially a PVC membrane, although they call it different and have a lot of Elvaloy (if i’m not mistaken) in the formulation. Elvaloy helps with chemical resistance and UV protection. IB also has Elvaloy membrane, which is marketed separately – IB Chem Guard, and is used on restaurants / chemical plants, etc. You do realize that this shrinking “thing” is more of a scare tactic. I only saw one PVC roof (over 25 years old) where the membrane shrunk noticeably. I don’t know the manufacturer though. All other old PVC roofs that I saw did not have any evidence of shrinking at all. Weldability was fine also. Statement that FiberTite is better is WAY too subjective. As you saw, IB and other PVC roofs weld just fine together. I will soon make a video of welding new IB roof to a 30 year old IB roof, and then, welding old IB to another old IB roof. Also I think FiberTite rep is trying too hard to sell you, for a roof this small. But it’s his job I guess. Bottom line, for a 240 sq. ft. porch roof – you might be worrying too much here. Nothing will happen to it as long as you have water drainage, and there is no physical damage to it. If this is true that means you can’t shovel snow off your roof (front porch.) That would be a definite deal-breaker! Another serious limitation. If a lagre branch fell and poked a hole in the membrane what would you do? Are these comments accurate? Any feedback is appreciated. Can you provide source of this information? To answer your questions – both statements are wrong! 1) PVC roof shattering did occur 20 years ago and ONLY to un-reinforced PVC membrane made by Trocal (which is now out of business, or more like was purchased by another roof manufacturer). Many Trocal roofs are still in service, but yes – that problem with them still exists. IB roof, as well as other PVC membranes have been made using polyester reinforcing mesh for decades and never had this shattering problem. 2) Older PVC roofs are EASILY repaired and are compatible with most other PVC membranes. Here is a link to an article on PVC Roof Repair which I performed on old Trocal and Sarnafil roofs (both over 20 years old). PS – the Trocal roof in that article did shatter because a branch fell on it. We easily welded new IB Roofing Membrane to it – no adhesives or sealants were used. This past winter the whole roof went, after a bigger branch fell on it. We installed a new IB roof in its place two months ago. Also, read a comment at the end of that PVC roof repair article, by a gentleman who used to work of Trocal over 25 years ago – it’s very interesting. Bottom line – the source you quoted exaggerates limited issues of Trocal un-reinforced PVC roof, and paints all other PVC roofing materials with same brush – it’s like Firestone tires on Ford cars had problems – so now ALL tires are defective? And NRCA would never make that “wide of a statement” on not walking on PVC roofs in less than 50 degree temperature. We install IB Roofs in 10 degrees weather and walk all over them and they are VERY flexible. As for shoveling – use plastic shovel with no metal or sharp edges. 10 x 30 flat roof over front porch. Rooled aspahlt at end of life-cycle. Researching replacement options. From what I read here PVC seems the way to go. Any recommendations on finding a qualified contractor in the Washington DC region? My sister’s house has a 10 ft. x 30 ft. flat roof over the front porch. 10 year old asphalt roll definitely at the end of its life-cycle. She’s in Washinton DC. I’m doing some research for her and just found your site. She wants low maintenance. From what I’ve learned on this site PVC seems the way to go. Any recommendations on finding a qualified contractor in that region? I did not see DC in your contractor list. Check out our IB Roof Contractors directory to see if we have someone in DC. If not, call IB roof and they will put you in touch with local rep who will get you the names of local IB roof installers. 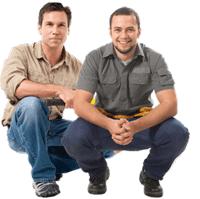 Let us know who you decide to work with and we will add them to the IB roof installers list. @Leo, you mentioned you think modified bitumen (such as torch down) is more puncture resistant than IB Roof in the above comment. I’m replacing a roof on a rancher set in the woods. We have lots of 80-100′ tall trees surrounding our house and branches up to 1″ thick often fall on the roof. We’ve trimmed any larger, dead branches. Based on your experience, would you install 1-ply torch-down granule, 2-ply torch-down smooth + granule, or IB Roof PVC? Thanks for your advice. Honestly – yes IB is more prone to punctures than Mod. Bit., BUT, it does not mean that it is easily punctured. In my experience, we never had to repair a roof for our clients due to falling branches or other objects, and many of our clients live in wooded areas with trees over their roofs. This is more of a concern for commercial roofs, where HVAC guys and other maintenance contractors randomly drop tools onto the roof and every once in a while poke a hole in the roof. I would recommend a PVC roof any day. If walling objects are that much of a concern for you, you can still use PVC roof, if you install it over rigid insulation and DensDeck substrate, using fully adhered installation. DensDeck will make you roof almost impenetrable – I’ve dropped a knife on such roof, blade down, and it just bounce off – no damage. This is a bit more money, but you will get a permanent roof that will not be affected by falling branches (unless a whole tree or some huge branch falls on it). Here is an example of IB roof installed over DensDeck – Flat Roof Decks – see video tower the end of the page. If you do decide to go with Mod. Bit. for one reason or another, definitely go with at least 3-ply system. 1 ply is definitely not enough and 2 ply is just about the same. Stone coated (granular surface) is much more puncture resistant than smooth surface roof. If fact, smooth surface is very easy to puncture. Still I recommend IB PVC roof, and even without DensDeck you should be safe. Like I mentioned above, we never had to repair a puncture damage. Hi,wanting to refoof my dad’s 56 yr old cement block home. It has a flat roof with an angled part of the roof,as well. It had tar/gravel, but it’s been reccommended I go with a newer system besides that. I do believe we have pretty much 100% need of wood replacement needed under the gravel. I called a roofing supply co. and they suggested 3 systems: TPO, “granule” roof (cap? ), and Hydrop stop (?). Hydro seemed to be putting down layers with coatings on top, building it up. Sorry for long explanation, but my Dads house is about his only asset and we need a quality, but economial fix. We live in Tampa, Fla – lots of rain and lots of sun. Your advice in this matter, esp any problems with our Existing roof condition, and whether IB PVC would meet our needs. THANK YOU, I feel grateful to have found your info. Oh, and is there any negative aspects to using pVC. First off – i’ve never heard of Hydro stop, but from what your are saying about it, is sounds like it’s a roof coating installed over some sort of reinforcement mesh … this is typically not a roof, but exactly that – a coating, and is installed over smooth surface existing, but leaking roof to extend the life and/or give a roof cool white color for improved energy efficiency. Granular surface roof has got to be modified bitumen (torch down system, or cold-applied) … IT COULD ALSO BE ROLLED ASPHALT but i don’t think any one is still using/selling that. Mod bit is also an outdated system but still installed often. I don’t think you want it – it’s heavy and not a cool roof, and I don’t think you need to worry about foot traffic on the roof, so the fact that mod. bit. is very puncture resistant is of no use for you / your dad. TPO i personally think is junk, though it does work similarly to the PVC roof that we install. It is popular mainly because it’s cheap, and it’s cheap because manufacturers us cheap ingredients to make it. And there are no miracles – cheap stuff will not last you 30 years. Actually no one knows how long it will last you and a warranty is just a piece of paper until TPO gets a proven track record which it does not have. So my recommend using IB PVC, though it’s slightly more expensive than TPO, you will have a piece of mind and a proven track record of 33 years, and a lifetime warranty. As far as negative aspects of using PVC – I don’t think so. It’s more expensive than alternatives, but if you divide the total price by at least 30 years the PVC roof will last you, you will see that on annual basis, IB is much less than any competition (I would not expect any roof mentioned above to last more than 20 years, and most will fail (start leaking due to seams/flashing voids – not bad installation) in about 12-15 years. I live in Spain and have a flat roof house. What surfaces can IB PVC roofing be laid on? Do you guys have a branch in Spain? OK, we’ve re-roofed the old bungalow — got the IB white roof on. How many of the IB 5″ vents should be on a 1400 sq. foot roof? We got two, total. One point — IB’s material comes in a variety of colors. Only one of them — white — has the very high “cool roof” emissivity. That high emissivity means it radiates heat away to the sky better, so less heat is transferred down into the roof deck — the roof gets cooler. IB has vents, and their spec shows insulation — as optional. Our roofer who put on an IB roof had no clue about this (and the IB rep said he was worried about causing an ice age with cool roofs. Then he looked at me for a while to see what I’d say. Then he said he was joking. Ha. Ha. ). People doing the roofing who don’t believe in the physics are going to have a hard time taking the physics seriously into account. The roofer was very surprised when I told him I’d measured a 25 degree F difference (crawled into the low attic and used an infrared thermometer on toe roof deck wood under the IB roof compared to wood that hadn’t yet had the IB put down — so comparing white IB roof with white DensDeck underlayment). Yep, 25 degrees cooler. This still holds up. And — this is important — this cooling works daytime and nighttime. It works _better_ at night, because the dark night clear sky is damn cold. Take an infrared thermometer and point it at a dark clear sky, you’ll be amazed how cold it is. That’s where the heat goes from a high emissivity roof, into that cold dark. (the old house and garage roofs were about the same). Fortunately, we’re in a coastal moderate climate where it rarely freezes or gets extremely humid, and can hope that the extra water condensing on the underside of the new cool roof will evaporate away. We had to argue for venting the roof–both the IB roof rep and the roofer said there’s no need to vent an IB roof because it doesn’t get hot, and wanted us to just do without and see if the city complained when inspecting at the end. That’s not the issue. I wish I’d understood this a whole lot better before we contracted for the roof — I’d have insisted on an inch of insulation caulked at the gaps or some other insulating and truly waterproofing layer _under_ the new IB roof. So it goes. Odds are the roofer knows his business and it won’t be a problem. But I wish I’d known more. We’re still waiting for the vents to come, but we do expect them, the city said the roof has to have at least some vents). I’m very curious how you handle this in your location, and whether you’ve gone in under new white IB (or other high-emissivity “EnergyStar” roofs like metal or cool roof shingles) and checked those particular roof materials early in the morning — right after sunrise — for moisture level. This isn’t peculiar to IB — but to the extent IB is better for getting rid of heat, it will be an issue. I’d like to see IB come out with a double-layer material, a sandwich of closed cell foam with their PVC on both sides. Weld tabs or ‘fins’ onto it and put the screws through those rather than through the whole material. That would both insulate and waterproof. Something similar could be made just using three separate layers, but any opportunity for moist air to get under a high-emissivity roof is an opportunity for condensation. After that, it’s a question of how to get rid of the moisture, which is always more of a problem than keeping it from condensing. I am interested in the IB roof system. I live in Kansas and have a flat roof on my garage. Can I get the materials and install it myself? If you are looking to expand into the midwest I possibly could be a representative. You can’t buy IB roofing materials, unless you are a certified IB Roofing Contractor. Also, you would have to buy hot-air welding equipment in order to install IB PVC roof, and it’s not cheap. I also do not think you can rent it. Besides, it takes a lot of practice to weld well. Basically, installing PVC roofing is not DIY project, unless you have experience with thermo-plastic roofing materials. As far as being a Rep. for IB Roofs – first, I’m sure there is a representative covering your region, but if you want, you should contact IB roofs directly about it. What price is for 10x10m material only, and what’s price with all work included? Can air pass through it, and no humiditi? Is it obtainable in CROATIA? I’m about to build a house in Bulgaria which has a very hot summer and an extremely cold and snowy winter. Your system seems ideal but you are a little far from that country. I wonder if you’ve ever sent your system that far away. can you provide me several contractors in Northern VA (zip code area 20190 is where I live) I need to replace my flat roof with IB Roof. I personally do not know any IB roof installers in Virginia, but recommend that you call IB Roofs directly. They will give you your local rep’s number. Your local rep knows all the certified IB roof contractors and will give you a few phone numbers ti call. I’m glad you want to use IB roof on your house. Leo..I think i have an IB PVC roof now. We are remodeling and adding on and I cannot find a roofer familiar with this material here in Altadena, Ca 91001. any ideas? an internet search has been unpromising. Help!! I understand what you are talking about when you say that “internet search has been unpromising”. I actually went looking for IB installers in Cali and other states and they just do not market themselves much … unfortunately. The best way for you to find a certified IB roof installer in your area is to call IB directly and ask them to put you in touch with local installers. They will give you their local rep’s phone number and he knows the contractors there – ask him for a few companies and call them. He should also pass on your information, but I think you should be proactive. Some contractors just “don’t want the business” as it seems… just my impression. Do you have anyone in Alberta Canada using or installing your product …..how about the cold weather we get in Alberta down too minus 42 degrees Celcius? IB roofs work very well in Alaska and Canada, and – 42 Celsius should not be a problem. Besides, IB installers up there know how to install (properly weld) in cold temperatures.